In the olden days, alter-ego Donald Blake struck his wooden cane - instantly transforming himself into the mighty Thor! However for you, me and anyone else looking at following actor Chris Hemsworth’s transformation into the physique of a Norse Thunder God, the switch isn’t exactly that easy. 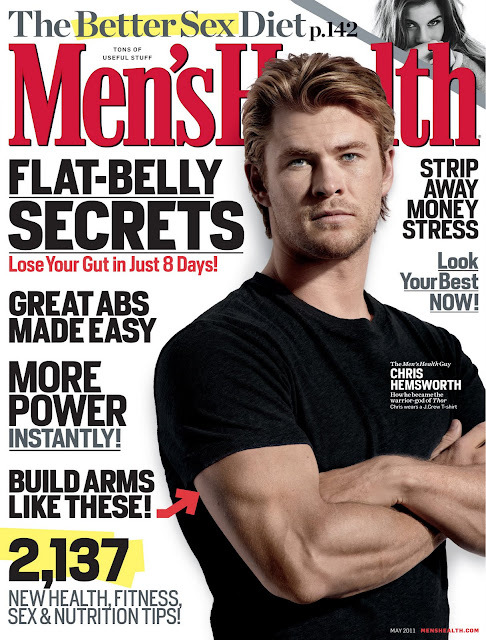 Thankfully Chris has spared a few moments for the May issue of the bible of all things fitness; Men’s Health, to pass on the tips and tricks he’s learned gaining the body of the Odinson, as well as spill a few beans on the movie itself and what it was like to work aside actual living legends who are his role models, like Sir Anthony Hopkins. Dr. Pepper are running a competition where you can win an ''intense work-out'' with the personal trainer that got Hemsworth into shape. Because, you know, Dr. Pepper is the drink of choice among people who work-out. just to be fair, I think we need a few shots of Emma Frost now. Wait, you guys get the cheesecake on these blogs 24/7. One time us girls get a post, and you're demanding "fair"? Yeah iok - somehow I doin't think Men's Health will be recommending that particular dietry supplement as part of the workout. The advertising dollar aye?! Amazing the places it can get you! As for reversing the scales of cheese vs. beefcake with the supple Emma Frost, not to sure on that one, though I do have plenty of Psylocke to help make the world go round! I like to give you a chalenge. I can handle some Loki too...I'm with Aliera...next post Dan. Loki. Give the masses what they want. Do Aliera and I qualify as "masses"? We have to qualify as female masses. As for Loki ladies - well I guess I do have a week more of Thor posts to fill! Maybe I should do a beefn'cheese cake of the week post? Though that title does just give me a hankering for Burger King!